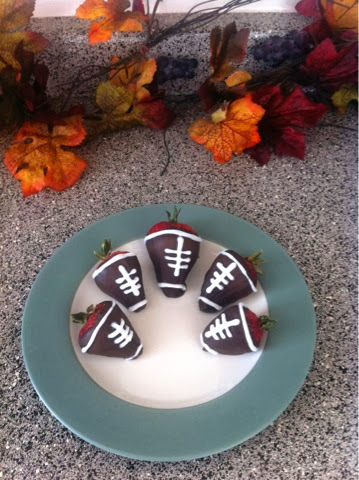 No tailgate is complete without a sweet ending (this is in addition to an MSU win ;) )! And this is the perfect bite-size treat... Who doesn't love chocolate covered strawberries?! 1. Wash and dry your strawberries; larger strawberries will work best. 2. Melt your chocolate following the instructions on the packaging and dip your fruit; place on wax paper to cool. 3. 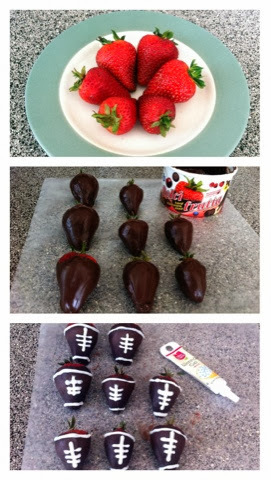 After the chocolate is dry, use the frosting to draw a stripe on the top and bottom of the strawberry. Then draw a line down the center with 3 intersecting lines (making the strings of a football).